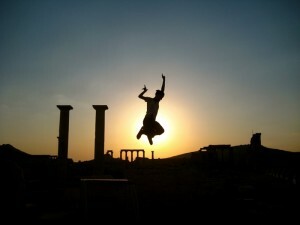 how: by bus, Al Sultan Bus Co.
Leaving Damascus was, in some ways, freeing. I had left behind my viruses, bad mood, discouragement, and I was ready to start again. I didn’t want to move away from Damascus feeling any other way because I knew that I wouldn’t have enjoyed anything if I was still feeling down. In the end, all I wanted was to feel better and I did. We took a 2.5 hour bus ride to Palmyra where we were dropped off about 2 km outside of the town, the only bus stop the town has. When we finished haggling a good price for a taxi ride (50 SYP) we arrived at our hotel, Sun hotel, dropped our bags off and walked to the ruins of Palmyra. The town itself it very small, and doesn’t have much character to it. Actually, the only reason this town exists is because of the many tourists that come to see it’s ruins, but it didn’t stop the Syrian hospitality from extending a warm welcome. The ruins, which are located in the city, are spectacular. We were told that Palmyra is best seen when the sun is setting and rising so we made a point to see both. A brief history of the town, Palmyra linked Persia with the Mediterranean Ports of Roman Syria and came under Roman control. During the following period of great prosperity, the Aramaean and Arab inhabitants of Palmyra combined Parthian and Graeco-Roman customs. 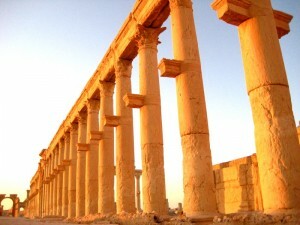 Palmyra is also mentioned in the bible, but as Tadmor (Arabic) and is described as a desert city built by King Solomon. More interesting for me was the story behind one of it’s greatest rulers, Queen Zenobia. Zenobia took over in the name of her young son, Vabalathus. However, the Romans were not happy about this decision and sent an army to kill the Queen. Zenobia defeated this Roman army and led her army to another victorious battle in Bosra and then successfully invaded Egypt. She then declared her independence from Rome and continued to expand her Empire. Although in the end she was defeated by Rome and lived the rest of her days there, she made her mark on this desert city. And on me. Palmyra was everything it was cracked up to be. Beautiful at sunset, night, and sunrise. The colonnaded streets and massive temples in the city are surrounded by an oasis and looked after by the citadel high above the city and is one of the most remarkable places I have been to so far.